Women That Soar is a Dallas-based media and content development company. We create and produce empower and inspiring content, for broadcast, online, digital media, live events and retreats. We provide a platform for women to connect, bond and share via our events and retreats. ‎We produce our annual, signature WTS Awards show, that honors a diverse group of women globally, for overcoming personal and professional obstacles, and Soaring to success! We’re a media company that builds B to B partnerships with corporations who want to promote and advertiser their products to the female consumer with purchasing and buying power. We have a database of over 150,000 women, with incomes of $55,000 plus a year. Since our launch in 2007, we have grown from producing a black-tie awards show, to producing televised specials, an annual awards show, and telling the inspiring stories of women around the world‎. Women That Soar is destined to be the next major media company for all things related to empowering and inspiring women to Soar and Celebrate The Brilliance Within! Gina Grant is a wife, mother of four and the CEO of Women That Soar (WTS), a Dallas-based media and content development company. WTS produces enriching online content, hosts live events, and provides community outreach via their four-tier platform. Mrs. Grant is a dynamic woman who empowers other women by sharing her story, and the stories of women who have successfully overcome trials and tribulations to turn their testimonies into ones of triumph! Mrs. Grant’s calling is to weave together these unique narratives and create a powerful medium for women to bond, engage and inspire one another. Grant’s desire and drive to empower and inspire women derives from her own journey. Once a teenage mother, the road traveled was not easy. She became a mother of her first child at the age of 17, and by the time she was 19, a mother of three; one daughter and twin boy and girl. Told by her parents welfare was not an option, she enrolled in college. After two and a half years of schooling, she dropped out and took a job as a secretary at Equitable Real Estate and Compass Management and Leasing. Within two years she worked her way up from Assistant Marketing Director to Director of Marketing. She ran the agency for 11 years, representing athletes and entertainers. In 2006, she outsourced her clients and followed her heart to launch WTS. In 2007, she held the first awards show honoring women. In 2012, she televised the awards show, becoming the first to produce and televise a live awards show in Dallas. 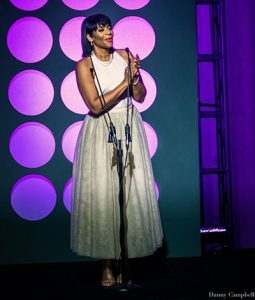 Mrs. Grant serves as the Executive Producer of the televised WTS Awards Show. She is a renown speaker, blogger and is currently working on her first book. Seven years later, Mrs. Grant is embarking on the next phase of her journey to have the show broadcast nationally on a major network. Shebelieving there are only two things she cannot do, she is now sharing her story, her journey, and her life lessons with other women. She is helping them to Soar! Reuben Cannon was born in Chicago, Illinois in 1946. He attended Southeast City College. Cannon worked at Universal Studios from 1970 to 1978, eventually becoming a casting director. He also was the head of television casting for Warner Brothers from 1977 to 1978. Cannon started his own casting agency in 1978 called Reuben Cannon & Associates. He has been credited with launching the careers of many of today’s major film and television stars. He is also a producer in both film and television.